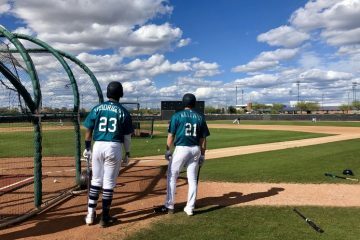 Since the publication of the 2018 Top 120 Fantasy Outfield Prospects, Part 1, Part 2, and Part 3, over four months passed, including Spring Training and two months of games. As such, there is significant movement in the top 120. Ronald Acuña Jr., Atlanta Braves. Prior to his injury, Acuña Jr. nearly surpassed MLB rookie limits. Luckily, he escaped what appeared to be a serious injury with just a mild sprain. 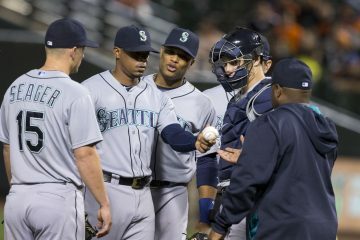 During May, his torrid pace slowed (.235/.290/.388) and he struggled with strikeouts (30.8%). Regardless, Acuña Jr. has a special, powerful bat, placing ninth in hard hit percentage. Juan Soto, Washington Nationals. In less than 45 days, Soto went from Low-A to the majors. Since he arrived, he impressed, hitting .333/.415/.500. With Adam Eaton and Brian Goodwin returning from the disabled list, it is unclear whether Soto will remain in the majors. However, given his early performance, the Nationals likely will continue starting him in left field. Austin Meadows, Pittsburgh Pirates. Nearly five years after the Pirates selected Meadows ninth overall in the 2013 draft, he finally received a long-awaited promotion to the majors. 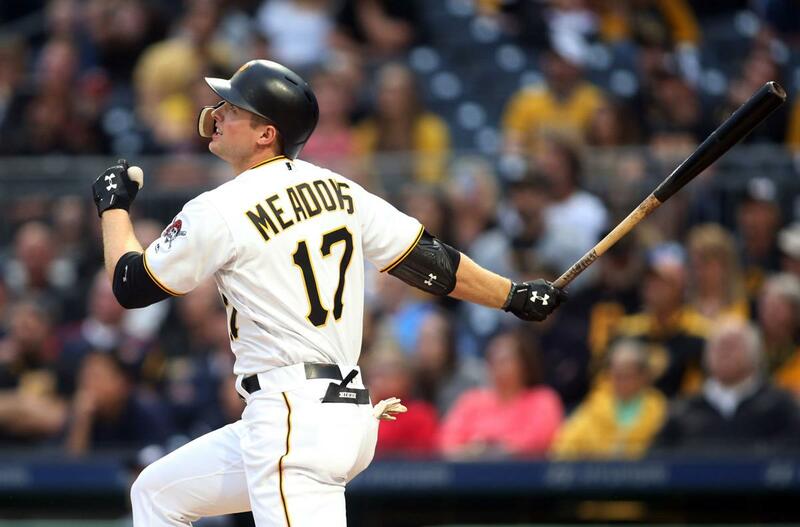 Although overshadowed by Soto’s debut, Meadows has had an equally loud start to his career. In just 13 games, he already has 4 home runs and 3 stolen bases! Dustin Fowler, Oakland Athletics. Back in the majors after his 2017 debut ended prematurely, Fowler is struggling (.174/.250/.304). A potential five-tool player, however, he has nice upside and requires patience. Franmil Reyes, San Diego Padres. Over 12 games earlier this month, Reyes hit an astounding .561/.647/1.317 with 4 doubles and 9 home runs! Subsequently, the Padres promoted him, and he already has 4 more home runs in 14 games. A hulking 6’5″ and 240 pounds, Reyes possesses huge 70-grade raw power. Eloy Jimenez, Chicago White Sox. With all the attention focused upon the debuts of Ronald Acuña Jr. and Juan Soto, Jimenez is fading into the background. Nevertheless, he is destroying Double-A, hitting .374/.419/.664 in May. With double-plus power and a steadily improving hit tool, Jimenez remains an elite prospect. Jo Adell, Los Angeles Angels. After returning from a thumb injury in early May, Adell dominated Low-A, hitting .367/.415/.755 with 5 home runs. Having seen enough, the Angels promoted him to High-A, where he already has 3 home runs in 9 games. A rare, dynamic power/speed talent, Adell is off to a tremendous start (.286/.351/.571 with 9 home runs and 6 stolen bases). Tyler O’Neill, St. Louis Cardinals. Despite impressing in the majors, including 3 straight games with a home run, O’Neill is back in Triple-A. On the year, he now has 16 total home runs with 10 coming in May. As Dexter Fowler continues to struggle for the Cardinals, O’Neill should receive another, hopefully longer, opportunity in the majors. Alex Kirilloff, Minnesota Twins. A first round pick in the 2016 draft, Kirilloff entered last year with high expectations following an impressive debut (.306/.341/.454). Unfortunately, he missed the entire season with Tommy John surgery. Now, Kirilloff is healthy and off to a strong start in Low-A, including a sensational May (.360/.423/.640 with 19 extra-base hits). Myles Straw, Houston Astros. The speedster easily leads the Minors in stolen bases with 32 in just 51 games. In fact, his pace picked up in May, with 18 stolen bases while hitting .367/.457/.413. An old-school, unique player, Straw is a high-contact (2.5 SwStr%), patient (13.9 BB%), slap hitter, spraying tons of contact the opposite way (48.5%). Drew Waters, Atlanta Braves. A second round pick in the 2017 draft, Waters performed well across two rookie ball levels in his debut last year (.278/.362/.429). Coming out of high school, he understandably slowed later in the year, and struggled with contact. Indeed, in his first 6 games in the Appalachian League, he struck out 18 times! This year, after a slow start in April and a minor injury, Waters returned to action in early May and took off (.325/.379/.675). With a tantalizing blend of power and speed, he has huge, five-tool upside. Jason Martin, Pittsburgh Pirates. Acquired in the Gerrit Cole trade, Martin may develop into the most prized acquisition. A steady performer the past two years, he is elevating his performance this year in Double-A, including a strong May (.359/.409/.592). J.J. Matijevic, Houston Astros. Although known as a bat-first, defensive liability, Matijevic still went 75th overall last year. His bat is that special. So far, he made quick work of Low-A (.354/.446/.708), earning an early May promotion to High-A. There, Matijevic ended May on a 13-game hitting streak. Meanwhile, his defense in left field is still well below-average. Vince Fernandez, Colorado Rockies. A tenth round pick in the 2016 draft, Fernandez is an underrated, line drive hitter with significant pop, but also plenty of swing-and-miss. Thus far in his career, he benefited from the Rockies’ hitter-friendly affiliates, and this year is no exception in High-A Lancaster. In May, he was on fire (.373/.481/.731), and, notably, hitting well at home and on the road. Buddy Reed, San Diego Padres. A terrible start to his career caused the former second round pick from Florida to fall off the radar of many. This year, Reed is displaying a lethal power/speed combination, with 9 home runs and 24 stolen bases in High-A. Austin Hays, Baltimore Orioles. Returning to Double-A after dominating the level last year, Hays is not finding the same success this year. It appears his aggressive, pull-happy approach is finally catching up to him. In fact, this past month, Hays walked just once, while hitting .227/.233/.386. Now, he is on the disabled list with an ankle injury. Monte Harrison, Miami Marlins. Although Harrison’s power (7 home runs) and speed (9 stolen bases) are on display, so is his swing-and-miss. Entering June, he is second in the Minors with 82 strikeouts (37.4%), including 42 strikeouts in May. Anthony Alford, Toronto Blue Jays. In early May, Alford “earned” a brief promotion to the majors, in which he went only 2-for-14. Prior to his promotion, he was hitting just .154/.214/.179. After his promotion, Alford did not fair much better (9-for-49). During the month, he went 11-for-75 with 26 strikeouts. Cole Brannen, Boston Red Sox. The Red Sox demoted Brannen to short season ball following a disastrous 8-for-66 stretch with 27 strikeouts in Low-A. Luis Robert (sprained thumb) is playing in games in extend Spring Training. Yordan Alvarez missed most of the month with a hand injury. Disappointingly still in Triple-A, Willie Calhoun left a game early this week for not running out a ground ball. Lazaro Armenteros made his debut in Low-A earlier this month. Big surprise (not): Roman Quinn suffered an injury, undergoing surgery to repair a torn ligament in his right middle finger (out 6-8 weeks). Bryan Reynolds (hand surgery) is back after missing seven weeks. On Wednesday, the Monthly Prospect Update will explore pitching prospects. Stay tuned! Good write up! Was looking forward to this one for a while. I have Jo Adell, Luis Robert, and Jesus Sanchez as my OF minors currently, in a deep league where about 185-190 prospects are being used. I promoted Soto recently and so picked up Pache to go with those previous 3. I was shooting for the highest upside but still ranked, as I typically try and use the Pache type guys as trade bait after they improve their stock a bit. I used the guys I picked up last year for a couple tweaks that amounted to Estevan Florial, Austin Riley, Jalen Beeks, and Taylor Trammel for Whit Merrifield, Brad Hand, Zach Britton, and a low 1st rounder. Do u think Pache is Florial/Trammell level next year or do u see one of your guys listed above as better? Re: Pache, I would refer to the Top 200 published in early May for players I believe are better. As for high-upside players listed above, I would keep my eye on Drew Waters. He has potential plus power and speed. Excellent writeup! Is there any update on Yordan Alvarez’s recovery? They said it was a minor injury…but we are going on over a month now. Thanks! Alvarez has been on the minor league DL since May 16th with a minor wrist injury reportedly suffered in an outfield collision on May 6th. Wrist injuries are tricky and bad sprains can take weeks to months of recovery. It appears he should be returning to action soon, as the Corpus Christi Hooks manager purportedly said he would return last week (though, he did not). Thanks for the updated write up, great work! Brinson has certainly fallen on hard times this year. Nevertheless, I would keep him over all those guys. Matias is basically a less-athletic Brinson 4 years ago. He has huge 70-grade power, and he gets to most of it in games, but also a highly questionable hit tool. The Matias hype is starting to get out of hand imo. Ramos is basically Brinson 5 years ago. Rosario is still far, far away, and has yet to hit for much power. In fact, he does not really have tons of raw power or speed (despite 12 stolen bases). Given the risk, he does not offer enough upside. Gimenez is an excellent defender and hitter, but with average raw power and only above-average speed. Very good prospect though. I still prefer Brinson. Hampson is a Rockies middle infielder with huge speed, excellent plate discipline, and improving pop. I am quite high on him, but I still prefer Brinson. As for Brinson, he remains a solid defensive centerfielder with great range. The Marlins have nothing to lose by continuing to play him. There is massive raw power and plus speed there. He is already in the majors. The hit tool is obviously a disaster. I would still give him time. Jason Martin is finally getting some well-deserved attention.